Flu shots can be a difficult topic in the vegan community. The internet has a lot of misinformation about vaccines in general, and flu shots in particular, which can make the topic controversial in the best of situations. In a vegan context, the conversation is complicated by the fact that flu shots are generally made with eggs. This leads to heartache, as people have to choose between what’s best for their own and their family’s health, and being true to values that they have worked hard to live by. This can lead to motivated reasoning, where people may choose to believe that vaccines are ineffective or unsafe, rather than face the ethical dilemma. I think it’s important to foster appreciation for science and objectivity within the vegan community, even when that means facing facts that we’re not wild about. Flu shots are a safe, effective technology, and we should seriously consider getting these vaccinations, even though they are generally not vegan. Flu shots are associated with better performance in a broad array of health outcomes. Flu shots provide about 50% protection against getting the flu in any given year. (That is, vaccinated people get the flu half as frequently as those who are not vaccinated.) While this is less than the complete immunity given by some vaccinations, it still makes a meaningful difference to individual and community health. It’s important to recognize that vaccinations, flu and otherwise, are not a strictly personal decision. Your choice to vaccinate or not affects those you come into contact with, and society more broadly. Even if you are not at high risk of flu complications, some of those that you come into contact with may be. By getting a flu shot, you are helping to protect your community members. Why aren’t flu shots vegan? The final vaccine is the isolated antigen — the virus proteins that the body recognizes as foreign, and develops an immunity toward. It’s these proteins, rather than the virus itself, that results in immunity. Are there any alternative methods of making flu shots? Yes! This is an area where there has been a lot of recent progress, partly because the existing egg-based production system is slow and difficult to scale. Because the technology has changed so quickly, vegan communities may not be up to date on the new flu vaccines. There continues to be a lot of research in this area, and I came across research toward plant-based recombinant flu vaccines while writing this post. It seems likely that vaccines will be more vegan-friendly in the future, in order to solve some of the technical limitations of egg-based vaccines. I’m comfortable calling the FluBlok vaccine vegan. I haven’t verified that its production uses no animal products, however this vaccine strategy does not require animal products fundamentally. Regardless whether it is strictly vegan, it is moving vaccines away from using eggs, which is something I’m happy to support. I think that vegans should get flu shots, including conventional flu shots when vegan versions are not available or are not medically appropriate for them. Vaccines save lives, including the immunocompromised and those who cannot get vaccines for medical reasons. We can all help them by getting vaccinated. If you’re able to get one of the new vaccines, you can participate in moving the science forward toward vegan solutions. Adults 18 years of age or older can get FluBlok vaccines. 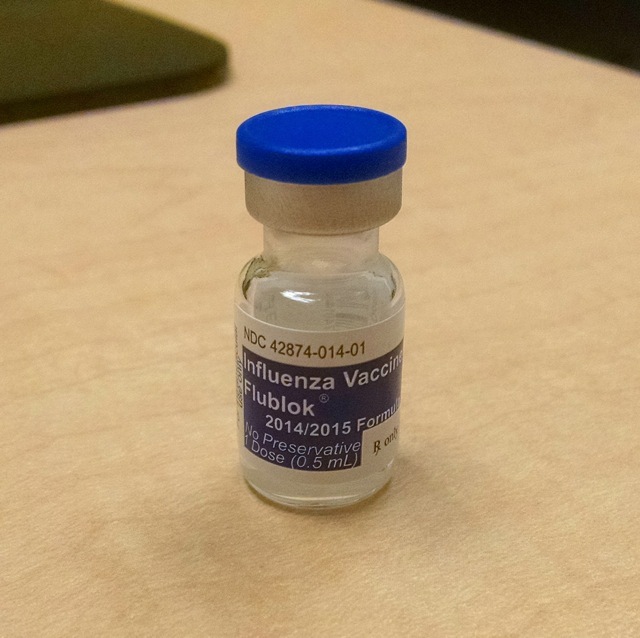 Since FluBlok contains only individually selected coating proteins from the flu vaccine, there is some concern that this vaccine strategy may be less effective. By contrast, if a vaccine contains whole virus particles (as in either conventional or cell-based vaccines), then your immune system can form antibodies to any of the virus’ proteins, rather than the selected few that recombinant vaccines contain. This may make this strategy more risky, so high-risk individuals may opt for other vaccine types. Other considerations: This is a relatively new vaccine type, so we know the least about its efficacy. While the CDC says that many people with egg allergies tolerate even conventional vaccines, FluBlok is the only vaccine that contains no egg allergens. I’m a reasonably healthy adult at low risk of flu complications, and I don’t have any young children in my household, so I chose this vaccine. Adults 18 years of age or older can get Flucelvax vaccines. The cell-based vaccines should be equivalent to conventional vaccines, and are expected to be similarly effective. The only difference is how they are produced. They may be a good choice for adults who are at risk for flu complications, and are not comfortable with recombinant vaccines. Cell-based vaccines are likely to have less egg allergen than conventional vaccines. Children from 6 months to 18 years of age should only get conventional flu shots. Children are at high risk of flu complications, and the newer flu vaccine types are not approved for them. Conventional flu shots are a very well established and studied technology, so may also be a good choice for those at high risk for flu complications, or those who are not comfortable trying a newer type of vaccine. How do you get a vegan flu shot? I chose to get a FluBlok vaccine this year. It’s the newest and most high-tech vaccine, and I wanted to find out how difficult it would be to get. I’m also excited by using recombinant genetic techniques to produce vaccines as a technology. I think this technology could do a lot of good for society (faster vaccine turnaround times, more efficient scaling of vaccine production), as well as removing animals from this sphere of medicine. This would be similar to how recombinant genetics were used to produce insulin from bacteria, instead of harvesting insulin from slaughtered animals. Update: I’ve posted an updated guide to getting a vegan flu shot in 2015. Notably, Flublok can now be found in Target Pharmacies. One widely available source of FluBlok vaccines is Passport Health. Passport Health is a chain of vaccination clinics that specialize in travel vaccines, all of which offer FluBlok given a few days notice. San Francisco has a Passport Health clinic, so I chose that. More recently, I’ve learned that you can find clinics that offer FluBlok (and other vaccines) online at http://vaccine.healthmap.org/. To find FluBlok, go to the Vaccine Finder site, uncheck all the vaccine types, then check only “Recombinant Flu Shot” within “Flu”. Enter your address, and it will list clinics that have registered as carrying it. According to Vaccine Finder, there are two additional clinics that carry FluBlok in SF: Pharmaca in Cole Valley, and Recharge Medical & Day Spa in Nob Hill. Note that Passport Health is not found by Vaccine Finder, so you’ll have to check for Passport Health locations separately for now. FluBlok’s website also has a list of clinics that offer FluBlok by state, however this list seems to be out of date, and did not contain either clinic listed in Vaccine Finder, nor any Passport Health locations, so I don’t think that list is very useful. For the time being, you’ll have to do a few searches to find the FluBlok clinic nearest you. It took about a 10-15 minute phone conversation to schedule an appointment and go through their triage to determine whether getting a flu shot was appropriate. Note that the triage questions are generic, and seem to be the same for all flu shots. Specifically, they will ask you about egg allergies. That doesn’t mean that FluBlok contains eggs, or that they’ll give you the wrong vaccine. It’s just on their list of flu shot questions to ask. I scheduled an appointment for a few days out, since Passport Health orders FluBlok as needed, rather than keeping it onhand. Once you schedule an appointment, there’s an online health information form to fill out, which takes another 10-15 minutes. Just basic health and medical background. The clinician met me in a shared reception area, and led me through a maze of identical-looking office doors to the Passport Health office. A few more questions, and we were on our way. The shot is just like any other flu shot. It makes your arm sore for a while, but otherwise is fine. The clinician let me take some pictures, and was accommodating and friendly, if slightly confused as to why I wanted photos of the vaccine bottle. The appointment, including the FluBlok vaccine, cost $30 total. That price seems to be very consistent online. I didn’t bother with submitting it to insurance, so I don’t know what the odds are of getting it covered. Medicine in general is not fully vegan. I recommend following medical advice in general, even when the medicine isn’t vegan, until vegan versions are available. For young children, this means getting conventional flu shots until the alternative preparations are approved for all age groups. However it’s exciting to see flu shots making this transition away from egg-based production. The new high-tech immunizations could have real benefits beyond the vegan community. They take less time to develop and produce at scale, and could respond more quickly to mutations, or to new strains as they emerge. We can participate in pushing medicine forward in this direction by opting for the newer flu shot preparations. The more people get the vaccine, the more safety data we gather, and the more trust we can have in the safety and efficacy of the new process. I’m happy to have participated in that process, in a small way. This is also a good example of using genetic modification to solve a problem (growing virus antigens for a vaccine) that couldn’t otherwise be solved without chicken eggs. This is a great use of recombinant genetics, and is an example where the vegan community could embrace this technology. So get a flu shot! If you’re a healthy adult, consider getting FluBlok or Flucelvax if they are available. Otherwise, just get a regular one. There’s a good chance that vegan flu shots will be widely available in the next few years. Recombinant vaccines might overcome some of the limitations of the egg-based vaccine production process. To illustrate this, let’s consider the 2012-2013 flu season. Since the flu mutates quickly, researchers have to make educated guesses about which strains will break out ahead of time, and prepare a vaccine for those strains. Sometimes they get this wrong, which is why the flu shot is only about 50% effective. In the 2012 flu season, an interesting situation emerged where the flu vaccine was less than 50% effective (and only 9% effective in seniors), yet the scientists had guessed correctly — 90% of flu viruses were a match for the vaccine. So why wasn’t the vaccine working? It appears that the 2012 vaccine lost its efficacy during this reassorting process, resulting in an H3N2 vaccine component that did not protect against that year’s H3N2 strain. Either a recombinant approach (like FluBlok) or a cell-culture growth process (like Flucelvax) would not require adapting flu viruses to grow quickly in chicken eggs, and should not be vulnerable to this mode of failure. Cell-culture processes (like Flucelvax) might be the most resilient to this type of failure, since it does not require modifying wild viruses at all, unlike both recombinant vaccines and conventional “reassorted” vaccines. The 2014 flu vaccine is having difficulty for another reason: the wild virus has mutated, and it would take too long to manufacture a new vaccine. Faster vaccine production technologies (including recombinant or cultured production methods) may help us respond more quickly to virus mutations in the future. This entry was posted in Guide, Research and tagged flu shot, medicine, vaccine on January 8, 2015 by Ed Pizzi. While homemade plant-based milks are delicious, they lack the fortifications of store-bought milks, which can be helpful to meet nutritional needs. This is especially true for families with children who are keeping to a vegan diet. This post explores fortifying your own plant-based milks, as well as shakes and other blended beverages. Why bother fortifying plant-based milk at all? Isn’t that playing into criticism that vegan diets are nutritionally deficient? The reason is simple. Those following conventional diets, whether they know it or not, benefit from public health infrastructure that includes fortifying foods to correct for common causes of malnutrition. For example, consider vitamin D. Many people who work indoors are low in vitamin D, especially in the winter. Because vitamin D is something that so many people are deficient in, dairy is typically fortified with vitamin D. Vegans don’t benefit from this fortification, so we should either fortify our own food or take a D supplement to match omnivore intake. I fortify plant-based milk with a vitamin D2 or vegan D3 pill, dissolved into the milk in a blender. I use an 5000 IU pill for a liter or so of almond milk, or for two glasses (~24-32 oz) of a shake. I haven’t found this to have any noticeable taste, or to add any grittiness to the milk. Just be sure to blend well, and avoid pills labeled as chewable or sublingual, as these usually have flavoring. They are fine for shakes, but are not neutral enough for milk. There is a long history of fortifying foods with vitamin D, so I think we’re on solid ground with this fortification strategy. I recommend fortifying with a calcium carbonate powder. This makes it easy to experiment with different amounts of calcium, since unlike vitamin D tablets, calcium does have a taste when added to some foods. For almond milk, I recommend adding 900 mg (the RDI is 1000 mg) per liter of almond milk. This is ~21% RDI for calcium per 8 oz serving. I’d add more, but I find the taste to be pretty strong, and the almond milk gets an unpleasant metallic taste at higher calcium doses. For shakes, especially protein shakes where you’re already adding powder, I’m often a little more generous with calcium, with 1200 mg or so per 24oz shake (~600mg per serving). Since shakes have a less neutral flavor, it’s less noticeable. 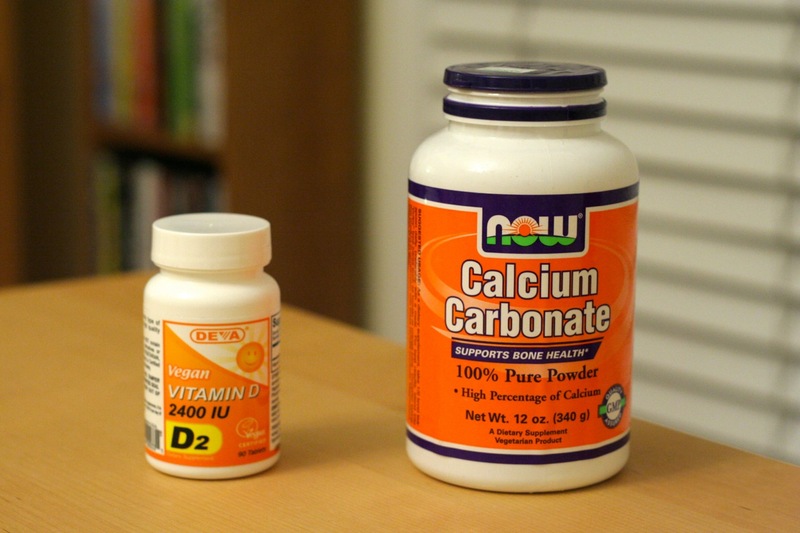 Don’t go too crazy though; exceeding 1000 mg / day of calcium may be harmful. There is good evidence that calcium from soy milk fortified with calcium carbonate is absorbed as well as calcium from dairy (and another, and another). I’m not aware of similar studies with almond milk or shakes, but calcium carbonate is effective as a fortifying additive, at least in soy milk. Vegans absolutely need a reliable source of B12, but I recommend taking a supplement for that, rather than relying on fortified foods, since supplements are easier to dose, and since B12 deficiency has such serious consequences. See veganhealth.org for detailed recommendations on vitamin B12. It’s also a good idea to talk to a doctor or nutritionist about any personal vitamin concerns. It may be possible to add other vitamins to blended beverages to meet your personal requirements. Be aware that some supplements (eg. DHA / EPA supplements) may have a strong taste, and may not be a good choice for blending. This entry was posted in Guide and tagged nutrition, plant based milk on December 28, 2014 by Ed Pizzi. One of the main adjustments involved in switching to a vegan diet is replacing dairy with plant-based alternatives. Almond milk was an early favorite of mine. It has a neutral taste, goes well with cereal, and makes a great hot chocolate. However nothing compares to the creamy deliciousness of homemade almond milk. Whereas store-bought almond milk can be a bit watery and thin, homemade almond milk is thick and creamy. Homemade almond milk is one of the great discoveries I’ve made since adopting a vegan diet. Even if you have never enjoyed almond milk, I’d encourage you to give homemade almond milk a try. Making almond milk is fairly simple. You soak almonds, blend them with water, and strain them through a nut milk bag, a fine nylon mesh bag made for this purpose. 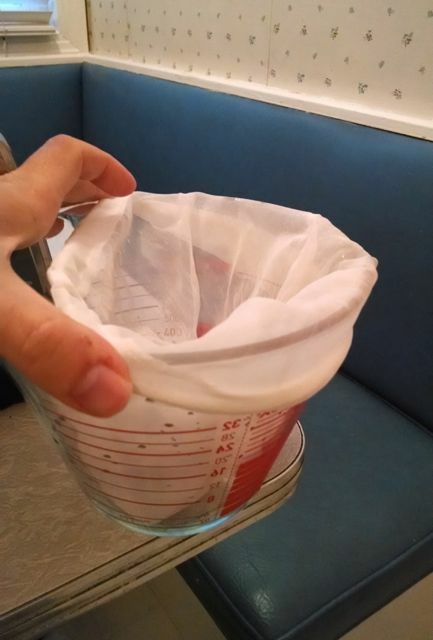 Nut milk bags are like a sturdier, finer version of cheesecloth. You should be able to find them at any health food store, although the heavy duty kind sold online are much higher quality than the ones I’ve found in stores. I’ve been using this Ellie’s Best bag recently. Typical almond milk recipes simply soak almonds, blend them with water, and strain. This leaves the almonds’ outer skin intact, and mixed into the almond milk, producing a grey color. The advantage of this approach is the easier process, and the skin nutrients remain in the milk. To make whiter almond milk, recipes may suggest blanching the almonds, which means removing the outer skin. 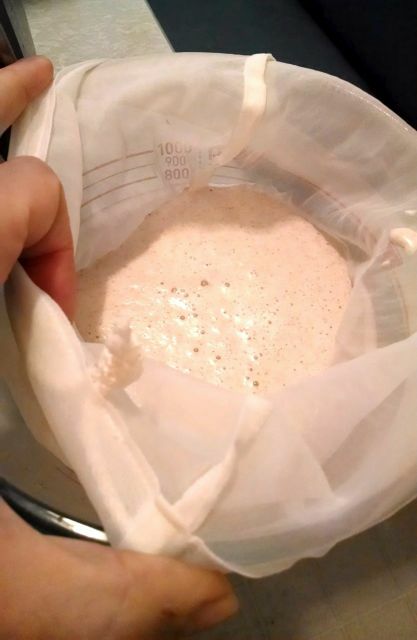 This does produce a whiter milk, but is tedious and labor-intensive. A minor complication is that almonds are a common oral allergen. Oral allergies are a type of crossover sensitivity typically caused by an allergy to a pollen that is similar to protein found in foods. 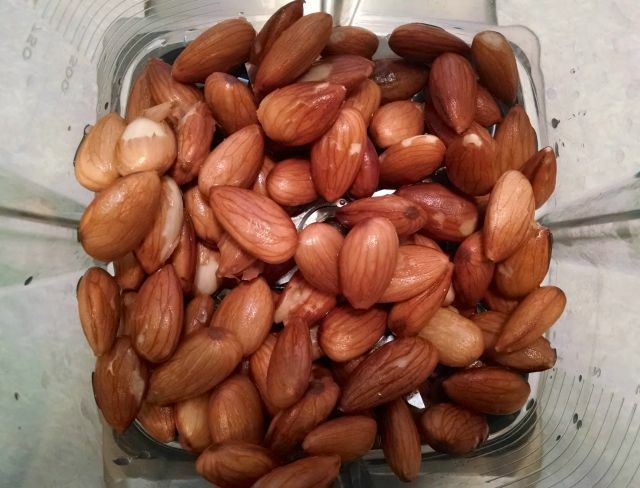 If raw almonds make your mouth itch, but you are not allergic to cooked almonds, then you may have almond oral allergies. An allergist can help you make this determination. Store-bought almond milk is pasteurized, whereas homemade almond milk made from raw almonds is not. This spells trouble for those of us with an oral allergy to raw almonds. To neutralize the oral allergens, we’ll have to heat the almonds at some point in the process. Here, I present an alternate approach, that has some of the benefits of both regular and blanched almond milk, without the time-consuming blanching process. This technique involves boiling almonds in some water for a few minutes at the beginning of the soaking process. Heating almonds to boiling temperatures denatures the allergenic proteins, making them safe for those of us with oral allergies. This is much easier than boiling the almond milk later, since almond milk has to be heated very carefully. Then, leave the almonds soaking in the water you boiled them in for up to a day, moving them to the refrigerator after they cool. 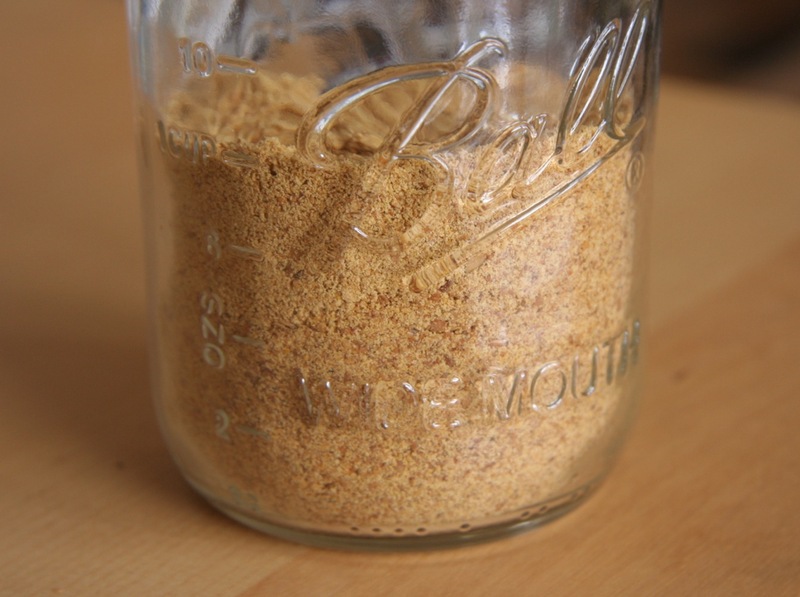 To make white almond milk, discard the soaking water (now a dark brown color) and use new water for the almond milk. If you’d rather preserve the almond skin nutrients, feel free to use this water for the almond milk, but measure it out so you use the right amount of water. 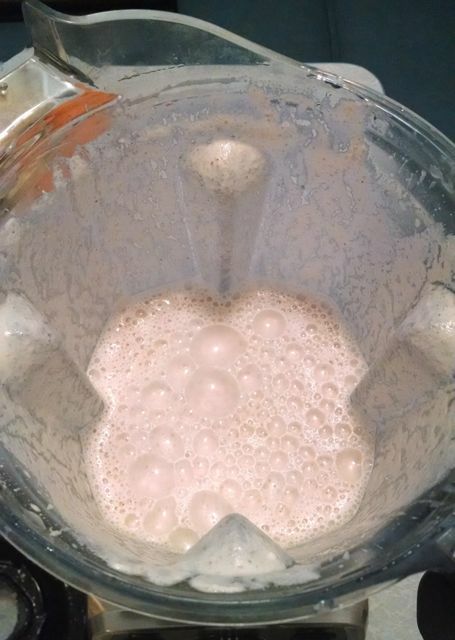 This approach is oral-allergy friendly, lets you make white almond milk easily, and produces incredible almond milk. You’ll need 1 cup of raw almonds, some water, a nut milk bag, something to boil and soak almonds in (a small pot works fine) and a blender. Ahead of time (8 to 24 hours is great, but shorter is probably fine), put the almonds in enough water to cover them by an inch or so, and boil for a few minutes. Then let them sit in that water and soak, covered. Put the pot in the fridge once it’s cool if you’re going to soak longer than 8 hours or so. 1. 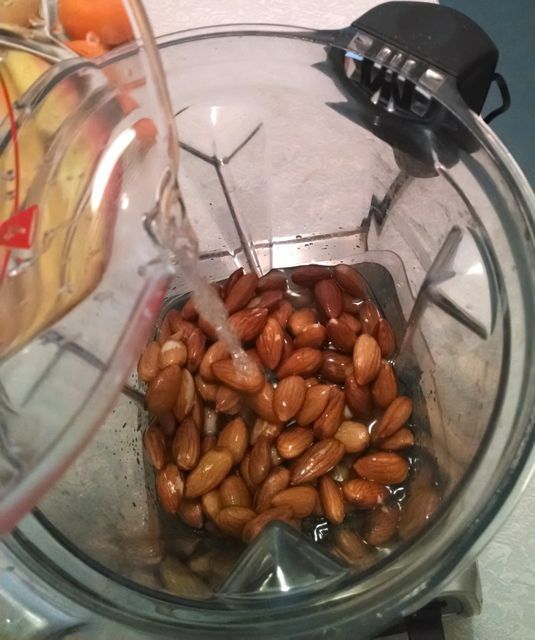 Blend the soaked almonds with two cups of water. 2. 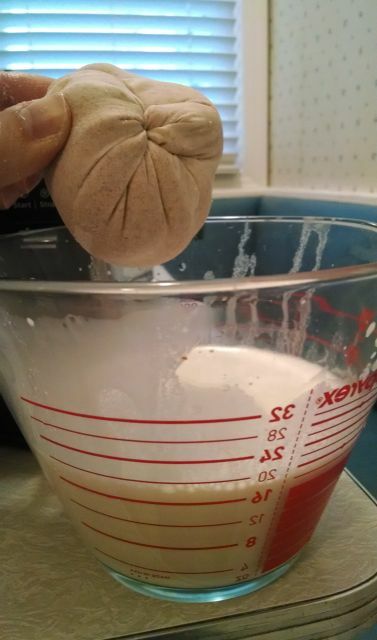 Pour the almond mixture into a nut milk bag in a container. I recommend using a pourable container like a large measuring cup, since we’ll be transferring liquid between this container and the container you’ll store the milk in. Be gentle, especially at first, to avoid almond solids from squirting out. You can use more pressure as the contents become more solid. Don’t stress too much if some solids escape. You’ll be left with the first pressing of almond milk and almond pulp. 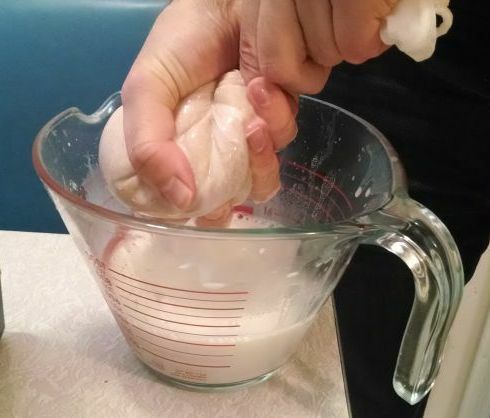 Don’t rinse the blender or wash out the nut milk bag, since we’ll be repeating this. Pour the almond milk into the container you’ll store it. Return the pulp to the blender, and blend with another 2 cups of water, to get all the almond milk we can out of the pulp. 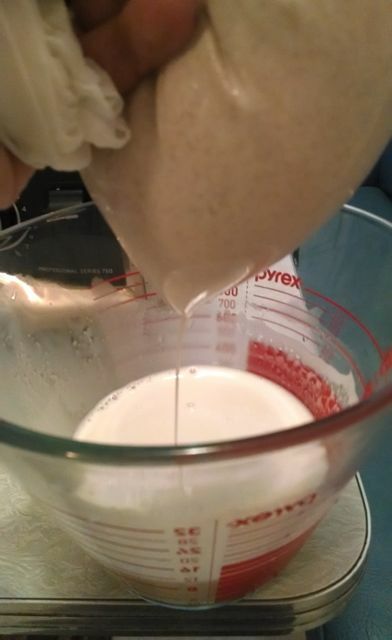 Strain again, separating pulp from almond milk. Finally, set aside the pulp, and return some almond milk to the blender (which is still messy, with almond bits on the side). Using the most recently pressed 2 cups will work fine. Blend for a bit to incorporate almond bits. Strain the milk one last time. 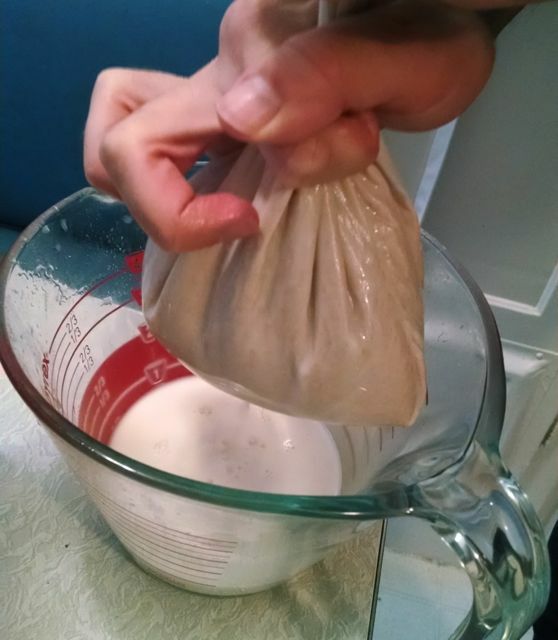 This will be really easy, since the milk has very little pulp, and will mostly pour right through the bag. Combine the almond milk from the two phases, and refrigerate. You should have about a liter of milk. Depending on how thoroughly you blended, the milk may be very thick, and may benefit from adding extra water. I find it’s best to thin it to taste after making it. 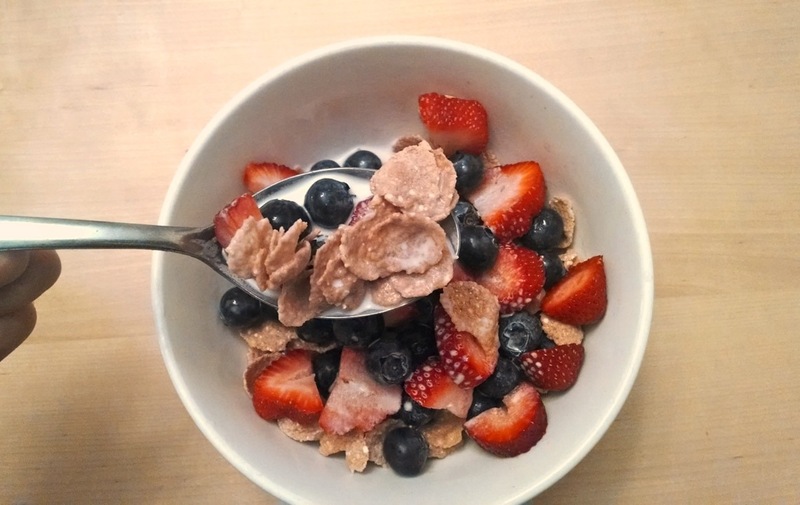 Serve over cereal with fruit (berries, peaches, etc.) for a delicious snack / dessert. You can make a really delicious milk by toasting the almonds first before making almond milk. This works fine from an oral allergy perspective, and adds a unique flavor to the milk. (It’s great with cookies, for instance!) However I can’t drink very much of that milk; it’s fairly rich, and is less versatile than regular almond milk, since it has a stronger flavor. For a while I was adding a few toasted almonds with almond milk that I otherwise prepared normally, to give it a little stronger flavor, although most of the time I don’t bother these days. Experiment and see what works for you. Not really relevant, I just think this something you should know about. 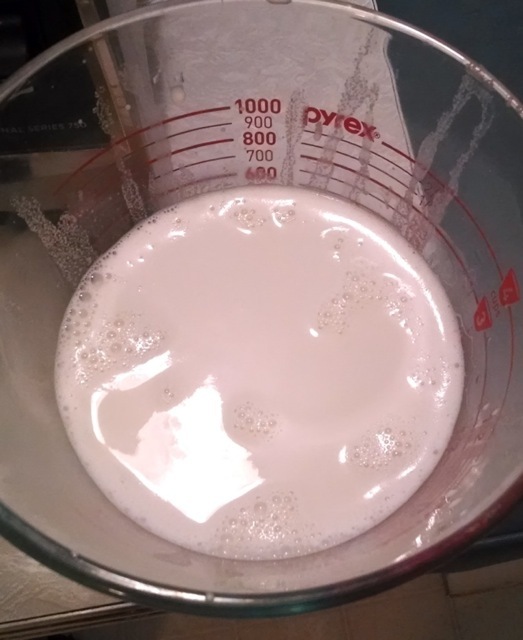 This entry was posted in Recipe and tagged plant based milk, technical breakthrough on November 3, 2014 by Ed Pizzi. As I explained in a previous post, it’s important to have a reliable source of omega-3’s. It took me some research and experimentation to find a cheap, hassle-free source of vegan omega-3’s that worked for me, so I wanted to share my findings. Since plant-based omega-3’s are in the form of ALA (alpha-linolenic acid), I’ll refer to vegan omega-3’s as ALA throughout this article. I wanted an easy source of ALA that I could add to my diet without a lot of change. I wanted to stick to a form that was fairly cheap, reasonably shelf stable, and which research supported as containing absorbable ALA. The ratio of omega-6’s to omega-3’s may be important, so I wanted a food that had few omega-6’s along with the omega-3’s. Finally, I have oral allergies which, while not life threatening, make many raw foods very unpleasant to eat, and possibly unsafe. I’d have to stick to a form of ALA-containing food that did not aggravate my allergies. I wanted a minimal dietary intervention, so while walnuts contain ALA, the ALA in walnuts is not very concentrated. You’d have to eat a lot of nuts to meaningfully boost your omega-3 levels, which would be a substantial dietary change. Similarly, tofu and soy products have ALA, soy ALA is also not very concentrated, and soy contains 10 times as much omega-6’s as omega-3’s. The most concentrated sources of omega-3 fatty acids are flax seeds. About two teaspoons of flax seeds gives the American Heart Association’s recommended daily dose of omega-3 fatty acids. Chia seeds are also a concentrated source. These are both promising candidates, so I focused on these. The first challenge is that ALA from whole flax seeds is not absorbed in digestion. This means that even though there is a lot of ALA in flax seeds, your body will get very little ALA from them. Generally I found that nutrition information on the internet to be in agreement with the research here — to get ALA from flax seeds, you have to grind them or process them into flaxseed oil. Interestingly, I found internet nutrition information to disagree with the research I could find on chia. Internet nutrition advice suggested that chia seeds, unlike flax, do not have to be ground for their ALA to be absorbable. However the only human study I found disagreed with this, and found that ALA was only absorbed from ground chia seeds, just like flax. Ok, so we’ll have to grind them. No problem. A coffee grinder or a Vitamix will do the trick. I wanted to incorporate flax or chia seeds into foods that I was already eating. Since it’s recommended to take flax and chia with lots of water, I wanted to use wet foods that I already eat frequently — oatmeal and lentil soup. The problem is that when exposed to water, flax and chia seeds form a gel-like texture that I’ve heard compared poetically to pudding, or less poetically to mucous. 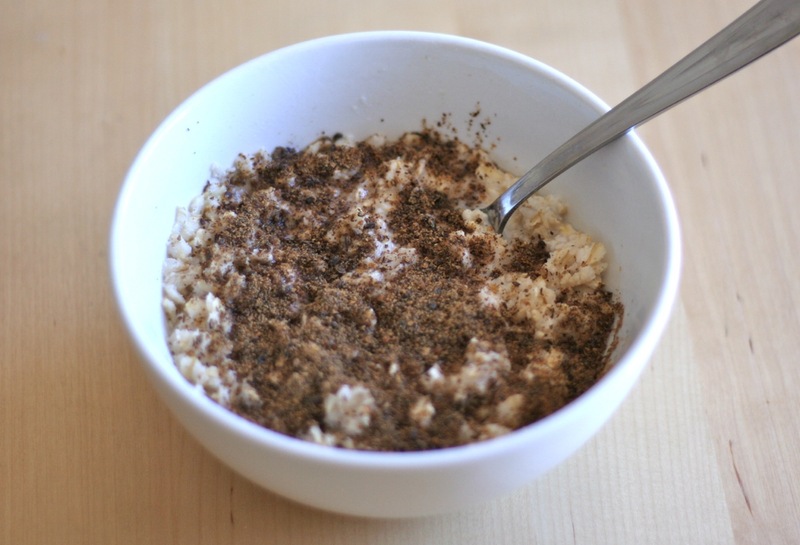 While I find the texture of whole chia seeds pleasant when added to oatmeal or soup (although it took some getting used to), I find the texture of ground chia or ground flax much less appealing when added to wet foods. Unlike whole chia, there are no crunchy bits to break up the gel mush. I’m curious if I’m alone here, because I couldn’t find much discussion online about avoiding gross textures with these seeds in their recommended wet form. One last constraint, although one that only affects 1% of people: I have an oral allergy to raw flax seeds. (I have a similar sensitivity to chia, but I haven’t looked into it in as much depth.) This means that I can only consume flax and chia seeds that have been heated. I decided to try roasting flax seeds to solve the allergy problems, then grinding the roasted seeds to improve ALA digestibility. This was delicious, and surprisingly, did not have any effect on the texture of oatmeal or lentil soup. It adds a pleasant roasted flavor to these foods. So far so good. So does the research support this as a source of ALA? Since ground flax seed is already established as an effective source of ALA, I was mostly concerned with whether or not roasting the flax seeds, grinding them, and then reheating them (in my case, adding them to oatmeal or soup) would compromise the ALA. Flaxseed oil is said to degrade when exposed to heat, so I was curious if the same would happen to my roasted flax seeds. I found a great paper on roasted ground flax! The researchers roasted and ground flax seeds, then baked cookies with the roasted ground flax seeds. They then analyzed the cookies for ALA content, and found them to contain ALA as expected. (I’m in favor of any research paper that has a “Evaluation of cookies” section.) They even tested cookies that were stored at room temperature for 90 days to measure shelf stability. They found that the ALA degraded only slightly over 90 days at room temperature. Another study tested heating whole and ground flax seeds, as well as flaxseed oil at 178°C (350°F) for 90 minutes, and found the ALA in whole flax seeds to decrease by 3.4%, while the ALA in ground flax seeds and flaxseed oil lost 6-7% of ALA. This is much better than I expected, especially considering that typical flaxseed roasting times are on the order of 15 minutes — 1/6th of the time used in the study. This study arguably supports cooking whole flax seeds and then grinding them, rather than grinding them first, although since we’re talking about a 3% difference, it doesn’t really matter. These studies did not measure absorption, but a third study demonstrated that ALA from baked goods made from milled flax is absorbed in digestion. Considering all of this, I think there is good evidence that roasted ground flax seed is an effective source of ALA. 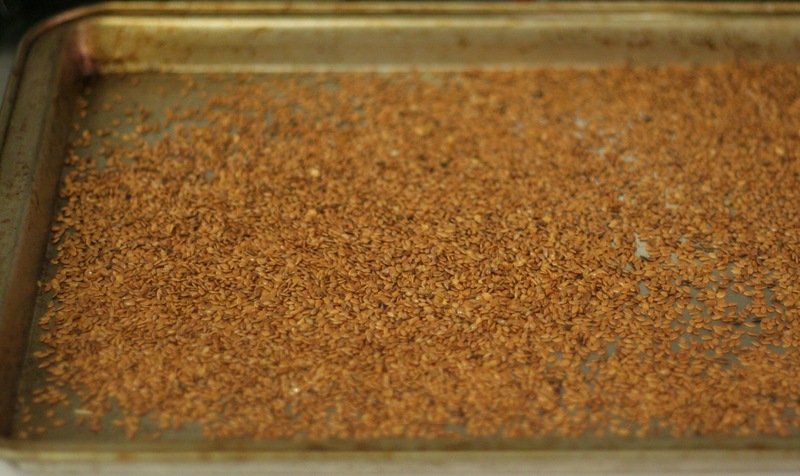 Spread 1 cup of flax seeds on a baking sheet, then bake for 10-15 minutes at 350°F, or until fragrant. Flax seeds hot from the oven. 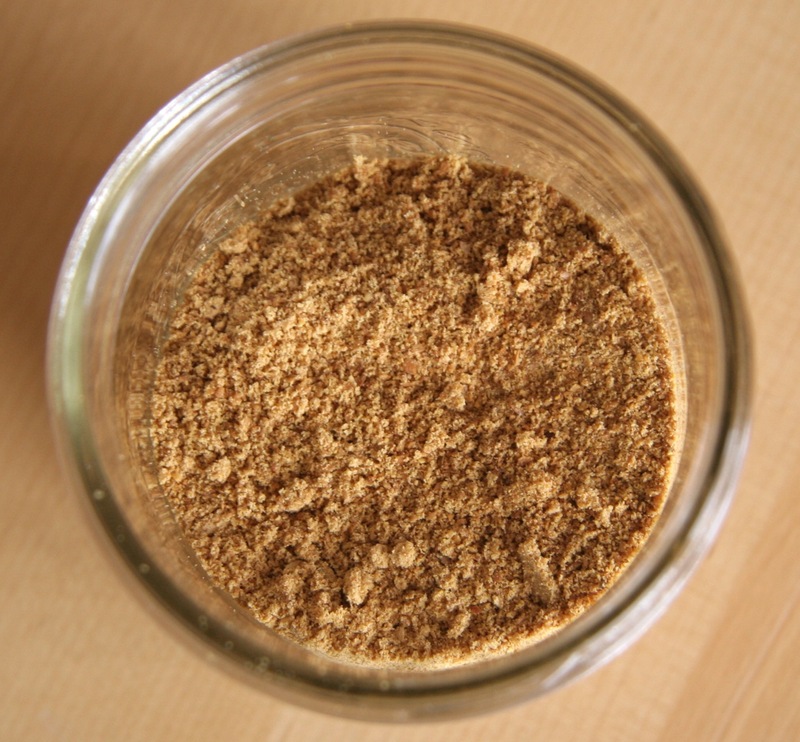 Grind the roasted seeds in a coffee grinder or high-speed blender. 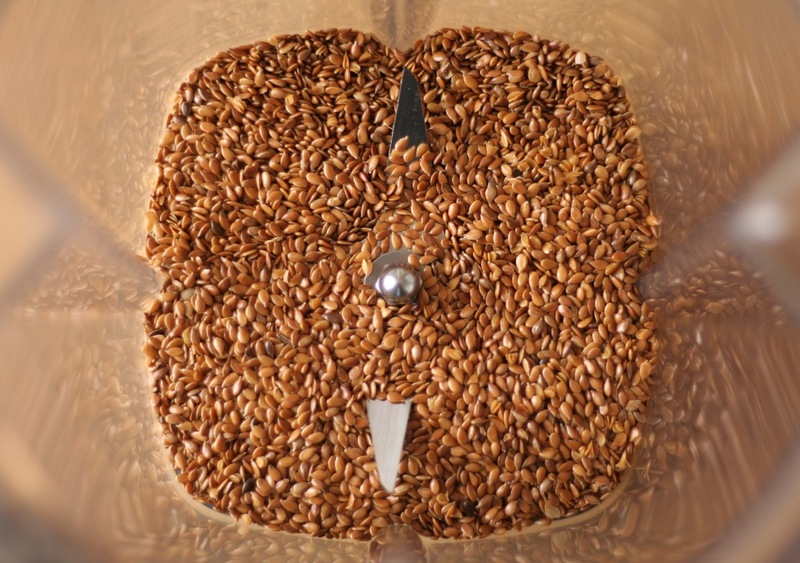 The ground roasted flax seeds take about 30% more space than the seeds did before blending. The roasted flax should be shelf-stable at room temperature, either whole or ground. You could also grind the flax first, and then roast it. Both should be effective sources of ALA, but note that ground (raw) flax is annoying to work with. It tends to clump together in the presence of any moisture, and its tendency to form a gel when wet makes it difficult to clean out of blenders, etc. If you have a strainer on your sink drain, the flax gel will stop it up. When possible, roast first. Add 1 tsp to foods, twice a day (so 2 tsp / day total). 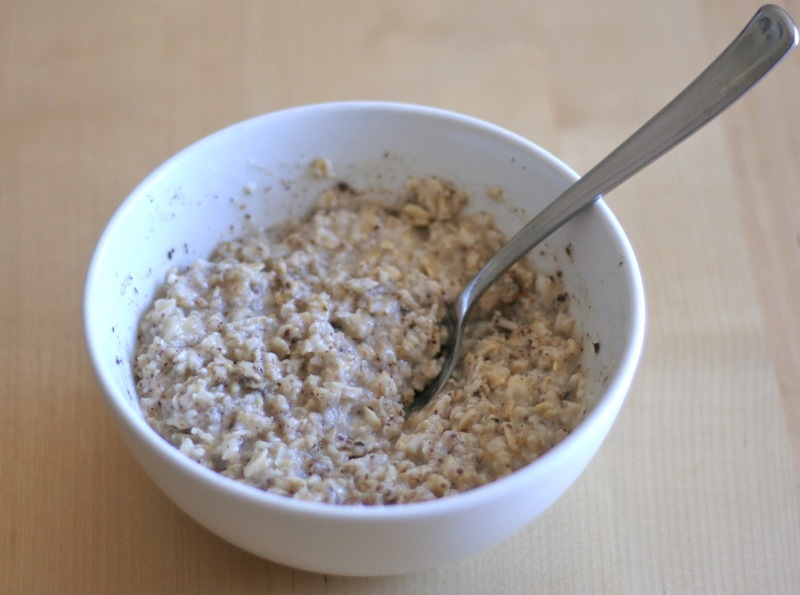 Here are some pictures of roasted ground flax in oatmeal. I may have used 2-3 tsp of flax here to illustrate how it disappears. Super easy, and cheap. I roasted 2 cups of flax a while ago, and it’s lasted me months. Just for kicks, I made a spreadsheet illustrating the various omega-3 approaches I considered. Austria JA et al. Bioavailability of alpha-linolenic acid in subjects after ingestion of three different forms of flaxseed. J Am Coll Nutr. 2008 Apr; 27(2):214-21. There is no RDA for omega-3’s, so I have to use 3rd party recommendations here — in this case, from the American Heart Association. In fairness, the AHA recommends fish, which contain DHA and EPA, rather than ALA, which plant-based sources of omega-3’s provide. I think an algae-based DHA supplement may be wise for vegans, or arguably oysters, if that is consistent with your ethics. 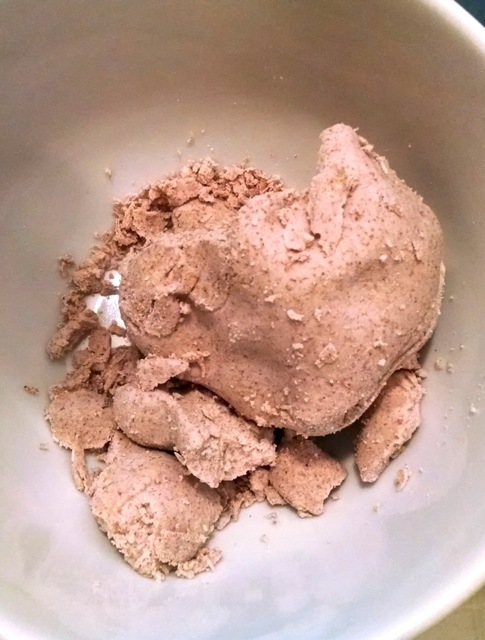 This entry was posted in Guide, Recipe, Research and tagged flax, omega 3, omega 3-part-series on July 24, 2014 by Ed Pizzi. Can flax seeds cause oral allergy syndrome? While researching a post on vegan sources of omega-3’s, I noticed that there is almost no information on the internet about whether flax seeds can cause of oral allergy syndrome. Oral allergy syndrome (OAS) occurs when an allergy (typically a pollen allergy) causes an allergic response to a similar protein in a plant food. Oral allergies vary in severity, although in my case they are just a cause of irritation — itching around the mouth and throat, and indigestion. Oral allergies are typically only triggered by raw foods, as heating often denatures the allergen, resolving the allergy. Oral allergies are often diagnosed by having reactions to well-known common oral allergy foods (such as those on this list) that is resolved by cooking the foods. I have been diagnosed with oral allergy syndrome, and I react to bananas, almonds, melons, carrots, and occasionally pears or apples — these are all common OAS foods. However I have identical symptoms to raw flax seeds, which I’ve never seen mentioned in lists of oral allergy foods. Is this really the same thing? If so, am I the only one? I wanted to research this to see if my flax sensitivity could be an oral allergy. I was able to identify only one study of flax seed allergic sensitivity that tried to distinguish true flax allergies from crossover oral allergy syndrome. This was a French study made up of a mix of allergic (one food or respiratory allergy) and non-allergic people. The study found only two cases of true flax allergy in the 1317 people, compared with 75 people who were sensitive due to cross-reaction (more or less equivalent to oral allergies). Since allergic people were overrepresented in this study, the rate in the general population would be even lower. The authors project that about 1 in 6000 people (in France) are allergic to flax seeds, whereas 0.5% to 1% of the population have cross-reactive sensitivity only to raw flax seeds. That is, not only can flax seeds cause oral allergy syndrome, but the vast majority of flax seed sensitivity is caused by OAS-like crossover allergies. First, some caveats: Since so few cases of flax seed allergies have been studied, it’s hard to definitively say how that allergy presents. We could also expect the rate of flax allergies to vary between regions because of different levels of environmental and dietary allergens. This study was conducted in France, and I’m not aware of another study taking place elsewhere. Finally, while rare, there have been cases of life-threatening anaphylaxis caused by flax seeds, so please talk to a doctor if you might be allergic to flax seeds! That said, this study suggests that flax seed sensitivity can be caused by oral allergy syndrome, and in fact the vast majority of people with flax seed sensitivity — 97% — have OAS-like crossover allergic reactions, rather than a true allergy. If you react to raw flax seeds, but can eat cooked flax without irritation, you’re not crazy. You are probably among the estimated 1% of people who have an oral allergy syndrome sensitivity to uncooked flax seeds. Fremont S, et al. Prospective study of sensitization and food allergy to flaxseed in 1317 subjects. Eur Ann Allergy Clin Immunol. 2010 Jun;42(3):103-11. PMID: 20648772. Authors project a 1 in 6000 rate of flax allergies compared to a 0.5 to 1% rate of flax cross-sensitivity. Ratio = (0.5 / 100) / (1/6000) = 0.5 / (1 / 60) = 0.5 * 60 = 30. Percentage = 100 / 30 = 3.33% (96.66%). If we use the 1% rate, we get 1.66% (98.33%). 97% is a conservative intermediate. This entry was posted in Research and tagged flax, omega 3-part-series, oral allergy syndrome on July 23, 2014 by Ed Pizzi. There’s some confusion about the importance of omega-3’s in a vegan diet. On the one hand, vegans tend to eat fewer omega-3’s than diets that include animal foods, and have higher ratios of omega-6 to omega-3 fatty acids. On the other hand, vegans tend to have lower levels of the diseases that omega-3’s are often cited as preventing (heart disease, cancer, blood pressure, inflammation). This is a conservative choice, as vegan omega-3 levels are lower than that of other healthy diets, and omega-3’s may have protective effects. High ALA intake (the omega-3 fatty acid found in plants) is associated with over a 50% reduction in heart disease rates in multiple studies. There are (inconsistent) studies that suggest that LDL-lowering diets (but not LDL-lowering drugs) may be associated with higher levels of mental health problems. Some researchers suspect that lower levels of omega-3’s may explain this. Ex-vegans sometimes cite mental health issues as reasons they changed their diet. Even though some may be playing this up, we should take their claims seriously, and look out for ways to improve mood-altering aspects of our diet. It’s worth noting that plant foods do not contain DHA or EPA, long-chain omega-3 fatty acids. There is good evidence that ALA (the common vegan omega-3 fatty acid, found in flax seeds, chia seeds, canola oil, walnuts, etc.) is converted efficiently to EPA, so I’m not convinced that vegans need to be concerned about EPA specifically, and I’ll focus on DHA. Higher DHA levels also correlate with lower rates of neurodegenerative disease like dementia, and vegetarians have less DHA than non-vegetarians. I think we should pay attention to this, even though vegetarians have less dementia than non-vegetarians. The rate could be even lower for DHA-supplementing vegans. For comprehensive recommendations about omega-3’s, see VeganHealth.org. The summary is this — until we know more, it would be wise for vegans to take a vegan DHA supplement a few times a week. If you’re an elderly, pregnant or breastfeeding vegan, then a daily supplement is probably best. I’d also recommend supplementing infants, especially if they are not breastfed. It is also probably wise to include some dietary source of omega 3’s (which will be ALA for plant foods) on a daily basis. I’ll follow up with more about how I’ve gone about doing the latter myself. This entry was posted in Research and tagged omega 3, omega 3-part-series on July 21, 2014 by Ed Pizzi. Coffee drinks with steamed milk were among my favorite foods when I went vegan. The first vegan coffee drinks I tried were pretty terrible, and it bummed me out to think that I would never enjoy a cappuccino again. It turns out that my fears were unfounded. A year later, I still enjoy cappuccinos just as much as I did before I went vegan. This is the guide to vegan coffee that I wish I’d had when I went vegan. The first vegan coffee drinks I tried used whatever non-dairy milks were available where I work (Soy Dream, or Silk, or something). They weren’t nearly as good as the dairy coffee drinks I was used to. Here’s the thing — in general, you can’t just throw together any vegan milk with coffee. Some vegan milks will have a flavor that overpowers or clashes with coffee. Others disintegrate in coffee, making a mess. This doesn’t affect the taste, but it’s not very appetizing. Another issue is sweetness. Many non-dairy milks are sweet, or have weird flavors (vanilla, etc.) that don’t really belong in coffee. While dairy milk has a similar amount of sugar as the sweeter vegan milks, the dairy sugar is mostly lactose, which doesn’t taste sweet, and doesn’t have a sticky texture. Finally, for steamed milk drinks, the milk has to foam. So the bad news: you have to be a bit more strategic with vegan milk. The good news is that there is truly excellent vegan coffee, and that many good coffee places understand this, and have good vegan coffee offerings. Soy milk is the most widely available vegan milk, and is the category of milk I recommend for coffee. I find that the flavor of soy milks intended for coffee to be mild, letting the coffee stand out, and the flavor is compatible with coffee. This milk foams well, has a taste that is subtle, and more or less disappears behind the taste of coffee, at least once you make the adjustment to soy milk in coffee. It isn’t unsweetened, but I don’t perceive it as sweet at all. And in the hands of a good barista, it looks great! You can tell a lot about a cafe from their choice of soy milk. Barista Series Soy is pretty much ubiquitous at quality cafes where I live in San Francisco — Ritual, Blue Bottle, Cafe Sophie, Reveille, etc. I’ve even found it while traveling internationally — Caffè Strada in Amman, Jordan. I haven’t found this soy milk in grocery stores (even the very well stocked Rainbow Grocery Coop), but it is available in bulk from Amazon. I’ve made a few Amazon bulk orders for my workplace. 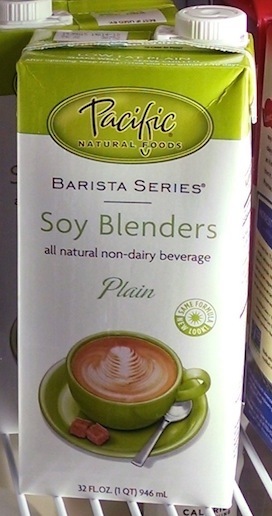 That said, I haven’t found anything that comes close to Barista Series Soy. When a cafe has a weird vegan milk (especially a supermarket brand), it’s reasonable to suspect that they don’t know what they’re doing. Give yourself time to adjust to soy milk, or any non-dairy milk. 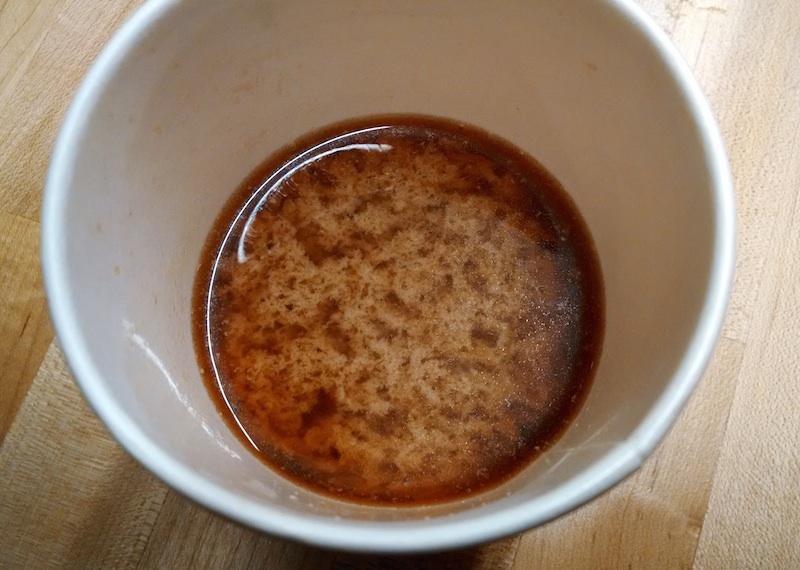 At first, you may think that soy milk in coffee is gross. That’s just fine. There’s a good chance it will change after an adjustment period. I was amazed at how completely I adjusted once I found a good soy milk. I’d recommend starting out with less milk than you’re used to. If your favorite dairy drink was a latte, I’d recommend starting with a macchiatto, then work your way up to cappuccinos and lattes. 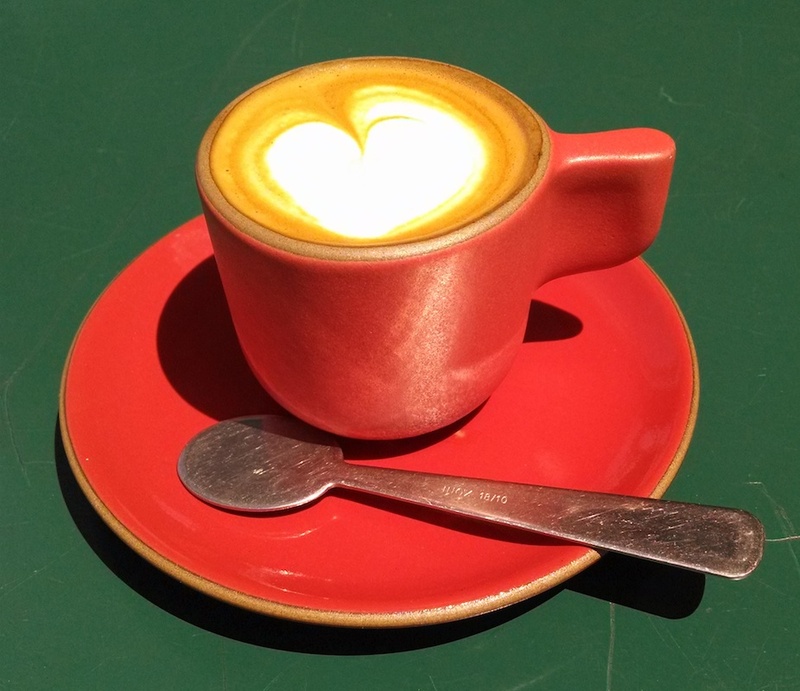 Some cafes may offer a gibraltar or cortado, even if it’s not on the menu. These are cappuccino-like drinks using less milk. After a month or two, I no longer noticed that soy cappuccinos tasted different from the dairy drinks I had been used to, and I had to double-check with the barista to make sure that my order hadn’t gotten mixed up with a dairy order. I never imagined that this would be possible when I started. Almond milk has been gaining popularity as a vegan milk for coffee, and some cafes offer almond milk as their only vegan milk — eg. The Mill, Linea. Almond milk is a great option for people who have soy allergies or who can’t tolerate soy for one reason or another. However I find the almond milk flavor to be overpowering and unpleasant in coffee, so I don’t recommend almond milk in coffee. Califia Farms almond milk seems to be the most popular almond milk for coffee. 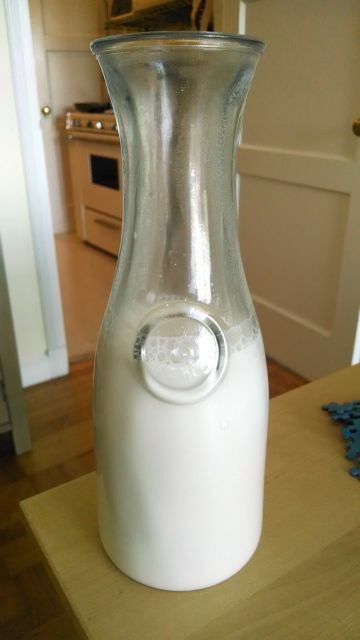 Califia Farms almond milk comes in funky shaped bottles, and must be kept refrigerated (unlike most vegan milks). This is brand new, and I haven’t had the chance to try it yet. 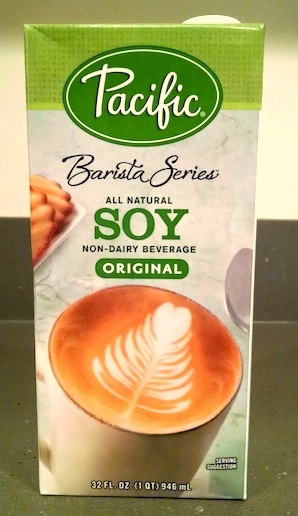 This is an almond milk made by the company that makes Barista Series Soy (discussed above). Timeless Coffee Roasters, a vegan cafe that knows what they’re doing, recently switched over to it for most of their almond-milk drinks (in addition to Barista Series Soy, and Califia Farms almond milk for a few drinks). I take that as high praise. The most basic vegan coffee is black coffee. This may not sound like the most appealing option, but you’d be surprised how good a simple coffee can be if it’s made with good beans, and hasn’t been over sitting on a burner all morning. So when your preferred options aren’t available, try black coffee. Sometimes it’s terrible, but it may surprise you, and you may develop a taste for it. I usually get black coffee or tea whenever a soy milk that I like isn’t available. And then there’s Starbucks. Starbucks gets a mention here because it’s ubiquitous, and because they do have a lot of vegan offerings, even though most of their drinks stretch the boundaries of what can be considered coffee. On the upside, Starbucks uses my favorite brand of soy milk. However they use the vanilla flavor, which is very sweet. This means that vegan drinks are sweeter than the (already quite sweet) non-vegan drinks. I’d recommend ordering less sweet drinks, in the smallest size available. Otherwise it’s kind of a sweet kick in the face. These are some cafes that I can attest to. If you’re new to vegan coffee, try one of these out if you have the option. These are just cafes that I have been to personally, so this list is hopelessly incomplete. If you know of a cafe with excellent vegan coffee offerings, leave a comment, and I’ll try to get there next time I’m in town. Timeless Coffee Roasters (oakland) – fully vegan cafe! Vegan coffee from some of my favorite cafes. So there you have it. A much longer post than I intended, and I may come back and try to condense all of this, but I hope the information is helpful. Have other coffee tips, or quality vegan milks that I missed? Please let me know in the comments! Thanks! 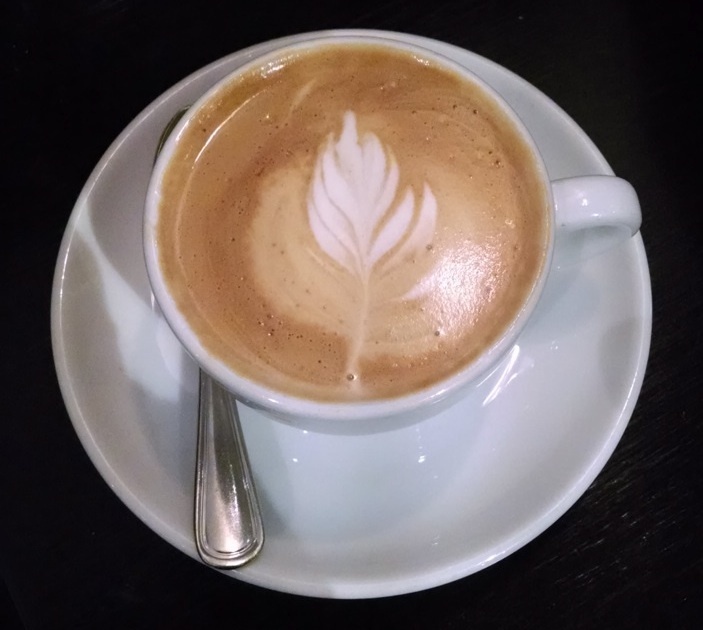 This entry was posted in Guide, Transition and tagged coffee on June 28, 2014 by Ed Pizzi.